Have you ever had one of those days - when you are behind the eight ball before you're even out of the driveway? It all starts with the alarm - are you up before it goes off because you had a terrible nights sleep? You know it'll be a bad day. Then the kids, those sweet little darlings, start whining and crying that they don't want to go to school, that they hate the outfit you chose, and that they want extra pancake syrup just as you finish off the last bottle in the pantry. It moves on when they refuse to get on the bus and you have to run one to school early so the other one, at another school across town, isn't late. On top of all that - it's raining outside, really raining in sheets so that no matter what everyone is getting completely soaked. My advice on how to manage to not lose your cool - remember that after everyone is dropped off you can have a few quiet hours to yourself to mentally recharge and do something nice for yourself (and of course buy more pancake syrup before tomorrow's drama begins). 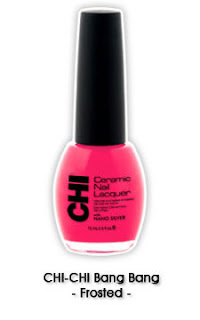 Beauty Tip Of The Day: Check out CHI nail polish for fabulous shine and hot, bright colors for spring and summer. I love "CHI-CHI Bang Bang," a hot pink shade with shimmer and plenty of attitude. and you can sit in your car and say ahhhhhhhhhhhhh!